Subscriptions have turned into a booming business for app developers, accounting for $10.6 billion in consumer spend on the App Store in 2017, and poised to grow to $75.7 billion by 2022. But alongside this healthy growth, a number of scammers are now taking advantage of subscriptions in order to trick users into signing up for expensive and recurring plans. They do this by intentionally confusing users with their app’s design and flow, by making promises of “free trials” that convert after only a matter of days, and other misleading tactics. Apple will soon have an influx consumer complaints on its hands, if it doesn’t reign in these scammers more quickly. However, the company’s focus as of late has been more so on getting developers to give subscriptions a try – even holding “secret” meetings where it evangelises the business model that’s earning developers (and therefore Apple itself) a lot of money. In the meantime, a good handful of apps from bad actors have been allowed to flourish. Today, the majority of the Top Grossing apps on Apple’s App Store are streaming services, dating sites, entertainment apps or games. But when you get past the market leaders – apps like Fortnite, Netflix, Pandora, Tinder, Hulu, etc. – and down into the top hundreds on the Top Grossing chart, another type of app appears: Utilities. How are apps like QR code readers, document scanners, translators, and weather apps raking in so much money? Especially when some of their utilitarian functions can be found elsewhere for much less, or even for free? This raises the question as to whether some app developers are trying to scam App Store users by way of subscriptions. We’ve found that does appear to be true, in many cases. After reading through the critical reviews across the top money-making utilities, you’ll find customers complaining that the apps are too aggressive in pushing subscriptions (e.g. via constant prompts), offer little functionality without upgrading, provide no transparency around how free trials work, and make it difficult to stop subscription payments, among other things. Here are a few examples. This is by no means a comprehensive list, but rather a representative one, just to illustrate the problem. A recent Forbes article listed many more, if you’re curious. Scanner App – This No. 69 Top Grossing app is raking in a whopping $14.3 million per year for its document scanning utility, according to Sensor Tower data. It has an unbelievable number of customer reviews, as well – nearly 340,000 as of today, and a rating of 4.7 stars out of 5. That will lead most customers to believe this is a good and trustworthy app. But when you parse through the critical reviews, you’ll see some valid complaints. Tap around in the app and you’ll be constantly prompted to subscribe to a subscription ranging from $3.99 a week to $4.99 per month, or start a free trial. But the subscription following the free trial kicks in after only 3 days – something that’s detailed in the fine print, but often missed. Consumers clearly don’t understand what they’re agreeing to, based on their complaints. And many of the negative reviews indicate customers feel they got duped into paying. QR Code Reader – Forbes recently found that TinyLab’s QR Code Reader was tricking users into a ridiculously priced $156 per year subscription. This has now earned the app the rank of No. 220 Top Grossing across the App Store, and annual revenue of $5.3 million. Again, this “free” app immediately starts pushing you to upgrade by starting a “free trial.” And again, this trial converts to a subscription after only 3 days. Can you imagine paying $156 per year for QR code scanning – something the iPhone camera app now does natively? Weather Alarms – With a 4-star rating after hundreds of reviews, this weather alerting app seems to be handy. But in reality, it’s been using a “dark pattern” to trick users into pushing a button that will start a free trial or sign them up for subscription. And it’s working – to the tune of over a million in annual revenue. A full screen ad appears in the app, offering two buttons – try for free or pay. The small “X” to close the ad doesn’t even immediately appear! Users then end up paying some $20/month for weather alerts. That seems…excessive? *After speaking to Apple about this app, Weather Alarms was removed from the App Store over the weekend. Translate Assistant – The same developer behind Weather Alarms offers this real-time translation app promising instant translations across over 100 languages and has 4.7 stars after nearly 4,000 ratings. But the app is also super aggressive about pushing its subscriptions. With every app launch, a splash screen appears with three different boxes – 1 month ($12.99/mo), 12 months ($44.99/year), or the “free trial,” which converts users to a pricey $7.99/week plan after only 3 days. Meanwhile, the option to “continue with a limited version” is in small, gray text that’s intentionally been designed to be hard to see. The app is making $1.3 million a year, per Sensor Tower data. As you can tell, the issue with many of these scammy apps is that they capitalize on people not reading the fine print, or they allow an app’s design to guide them to the right button to tap. Trickery like this isn’t anything new – it’s been around on the web as long as software has been sold. It’s just that, now, subscriptions are the hip way to scam. These developers also know that most people – especially if they’ve just downloaded a new app – aren’t going to immediately subscribe. So they push people to their “free trial” instead. But that “free trial” is actually just an agreement to buy a subscription unless you visit the iTunes Settings and cancel it right away. Many of these “free trials” convert almost immediately, too, which is another way developers are cashing in. They don’t give you time to think about it before they start charging. “It’s incredibly frustrating how little has been done to thwart these scams,” says Contrast founder and longtime developer David Barnard, who apps include Weather Atlas and Launch Center Pro. “It erodes trust in the App Store which ultimately hurts Apple and conscientious developers who use subscriptions,” he says. The issue of scam apps may not always be the failure of App Store review. It’s possible that the scammy apps sneak in their tricks after Apple’s App Review team approves them, making them harder to catch. But for the time being, users have to take it upon themselves to cancel these sneaky subscriptions. Unfortunately, Apple isn’t making it as easy for users to get to their subscriptions as it could be. “The App Store has always been a great place, overseen and curated by highly intelligent and ethical people. I believe the App Store can stay as it always has been, if the right measures are taken to deal with those developers who trick the system,” Zhadanov adds. Today, most subscription-based businesses thriving on the App Store come from legitimate developers. But they know how scammers could easily ruin the market for everyone involved. If allowed to continue, these scams could lead to consumer distrust in subscriptions in general. In a worst-case scenario, consumers may even go so far as to avoid downloading apps where subscriptions are offered as in-app purchases in order to protect themselves from scams. For now, Apple is largely relying on user and developer reports via reportaproblem.apple.com – a site most probably don’t know exists – to help them fight scammers. It needs to do more. In addition to making access to your subscriptions easier, it also needs better police “Top Grossing” utilities and productivity apps – especially if the service’s value is questionable, and the 1-star reviews are specifically calling out concerns like “sneaky billing” or mentions other subscription tricks. 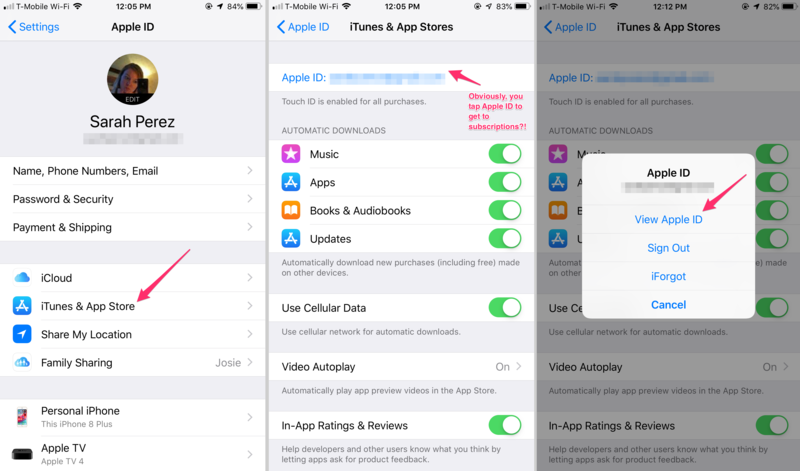 Apple declined to comment on the matter, but its Developer Guidelines clearly prohibit fraudulent behavior related to subscriptions, and insist that apps are clear about pricing. In other words, Apple has grounds to clear out these scammy subscription apps, if it chose to focus on this problem more closely in the future.